Peter Lieberman started out as a guitar builder but for the last 20 years has been a premier ukulele maker. For a while Peter ramped up his operation and had three other builders working along side him. In 1998 Peter’s shop burned down when he ignited lacquer fumes while cutting a door jam with a sawzall. He injured his hand trying to put out the fire and was forced to shut down his operation. A few years later he was back to building ukes but decided to just be a one man custom shop which is what Maui Music is to this day. 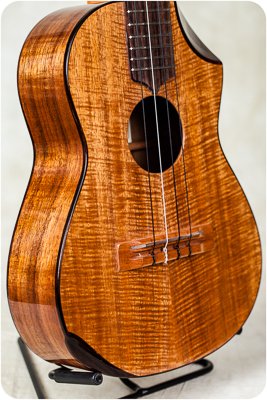 Maui Music ukes generally have a very clear and balanced tone with plenty of volume and sustain. They are very classic Hawaiian in tone. I would say they are comparable to a Kamaka or Ko’olau type of sound versus the more modern tonality in KoAloha and Kanilea. I like them and wish we could have a regular stock of these. However, being a one man shop means limited production and availability. I’ve let Peter know of our desire to stock these and basically take all he can make. He simply says, “I’ll do my best”. What more can I ask. Thanks Peter, it’s a pleasure to show your work. Love the bevel tenor except fort hose awful heavy hard to use tuners on it. If it had nicer tuners I’d grab up this uke in a minute. Ya, when I list it there will be an option button to add Gotoh UPT tuners. I agree. I like the headstocks, but that beveled tenor is weird.